Max Stirner’s The Unique and Its Property (1844) is the first ruthless critique of modern society. In All Things are Nothing to Me, Jacob Blumenfeld reconstructs the unique philosophy of Max Stirner (1806-1856), a figure that strongly influenced–for better or worse–Karl Marx, Friedrich Nietzsche, Emma Goldman as well as numerous anarchists, feminists, surrealists, illegalists, existentialists, fascists, libertarians, dadaists, situationists, insurrectionists and nihilists of the last two centuries. Misunderstood, dismissed, and defamed, Stirner’s work is considered by some to be the worst book ever written. It combines the worst elements of philosophy, politics, history, psychology, and morality, and ties it all together with simple tautologies, fancy rhetoric, and militant declarations. That is the glory of Max Stirner’s unique footprint in the history of philosophy. Jacob Blumenfeld wanted to exhume this dead tome along with its dead philosopher, but discovered instead that, rather than deceased, their spirits are alive and quite well, floating in our presence. 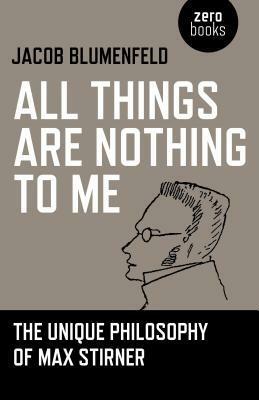 All Things are Nothing to Me is a forensic investigation into how Stirner has stayed alive throughout time.